Abeno Nakamaro or Abe no Nakamaro (阿倍仲麻呂, abe (no) nakamaro) (c. 698 – c. 770 C.E.) was a Japanese scholar, administrator, and waka poet of the Nara period. Little is documented about his life except that he went to T’ang China as part of an embassy of 570 delegates from Japan in 717 and remained there until his death. History shows that China, Korea and Japan had frequent cultural and economic exchanges. Nakamaro was 16 when he was sent to China as one of the young students that the Japanese government sent to China. Most of those students sent to China came back to Japan after the assigned period and worked as intellectual leaders in Japan. However, Nakamaro, for reasons unknown, climbed the bureaucratic political ladder of the Chinese government and served as a governor in China. He unsuccessfully tried to return to Japan and subsequently died in China. His poem filled with a nostalgic sentiment longing for his hometown was recorded in the Japanese classic poetry book Kokinwaka-shu. It is remarkable that a man of talent can serve in a country that is not his own. Nakamaro is famous for a poem filled with intense longing for his home in Nara. ama-no-hara furisake mireba kasuga naru mikasa no yama ni ideshi tsuki kamo. Loosely: On the horizon—isn't that the same moon that rises in spring over the Hill of Mikasa? Every aspect of the life of Nakamaro has been thoroughly researched by scholars using the few documents and resources available. Writers have recorded many tales of his unusual experiences and the romance of his life as a pioneer of the eighth century. Scholars do not agree about many details of his life. 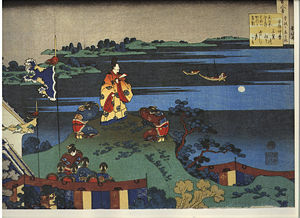 Some say that he never married, while others believe that he must have had a family because of a passage in the Shoku Nihongi（続日本紀, an imperially-commissioned history of Japan written in the early Heian period), which relates that Nakamaro had “Kazoku,” which probably means a family, who were left in the Tang Dynasty of China. During the Tang Dynasty (618–917 C.E. ), the city of Chang’an rivaled Constantiople and Baghdad as one of the largest cities of the world, with a population of one million. Among them were more than ten thousand people from different ethnic groups; international marriages were common and were officially sanctioned by the government of the Tang Dynasty. It is unlikely that a young, elite bureaucrat like Nakamaro would have remained unmarried for more than fifty years. The ninth embassy to Tang China was the first after the new capital had been moved to Heijo (Nara). Four large ships transported an unprecedented delegation of 570 people, who arrived in Chang’an after a journey of eight months. Tang China was at the height of its power during the first half of the reign of Emperor Tang Xuanzong (Chinese: 唐玄宗) (712–730), known as the Kaiyuan era (開元之治). The Shoku Nihongi（続日本紀） praised Nakamaro and Kibi no Makibi (吉備真備) as brilliant students representative of Japan. Wang Wei (Traditional Chinese: 王維) (701–761), sometimes titled the “Poet Buddha,” a Tang Dynasty Chinese poet, musician, painter and statesman, composed a poem in which he mentioned Nakamaro as a young man of distinction, who was expected to have a bright future. Even in the strict class system of the Tang dynasty, Nakamaro was able to enroll in the highest seat of learning, perhaps because he came from the illustrious Japanese family of the monk Bensho. Bensho also came to visit Tang because of his skill in playing the game of Go (like Chinese Chess); Emperor Tang Xuanzong liked him and some scholars believe that this eccentric monk was possibly able to support Nakamaro’s candidacy. Nakamaro was particularly gifted and sincere, a person of character who did not yield to anybody of the Tang Dynasty. The second Sui emissary to Tang, Ono no Imoko ( 小野妹子) had his name changed in China to “So In Kou”; during the period of embassies to Tang China, it was common to change a Japanese first name to a Chinese one. Nakamaro changed not only his first name but also his family name, and became “Chao Heng.” Several delegates from the Japanese embassies to Tang China were given honorary posts in government service, but only Nakamaro and Fujiwarano Kiyokawa actually served as high ranking officers, and both made China their final resting place. As “Chao Heng,” Nakamaro formed a close friendship with Li Bai or Li Po (李白) and Wang Wei (王維), the foremost poets in the Tang Dynasty. During the early days of his stay in the Tang Dynasty, when he was 27 years old, Nakamaro received the gift of a poem from a famous poet named Chu Guangyi. The poem mentioned a declining sun that hung low over a many-storied building, and an autumnal breeze that blew to “Dobo.” The “Dobo” signified several things, including the room of a newly married couple. One scholar interpreted this poem as being a tribute to the advancement of Nakamaro’s career at a young age. When he heard a rumor that Nakamuro had died in a misadventure, Li Bai was so sad that he wrote a poem in memory of his Japanese friend. Many elements of Japanese culture originated in China. After entering China, Buddhism was introduced into Japan by monks of the Korean Baekje kingdom in 538, and became closely related to the power of the Japanese state. Prince Shotoku Taishi (聖徳太子, born 574 C.E. ), promoted state Buddhism and began sending embassies to China to study Chinese civilization in depth. These embassies took place over a period of 260 years. During the Chinese period of Sui (隋), they were called “Embassies to Sui China,” ( kenzuishi, 遣隋使), then “Embassies to Tang China” (kentooshi, 遣唐使). Starting in 607, there were five missions to Sui China, and later there were 18 or 19 to Tang China, from 630 until the last one in 838, with the priest Ennin. A mission planned with Sugawara no Michizane (菅原道真) in 894 was cancelled due to internal problems in China. The main purpose of these missions, which included Japanese court officials, diplomats, merchants, engineers and many Buddhist monks and scholars, was cultural exchange and trade with China. They brought many innovations back to Japan, including new Chinese vocabulary words. Many temples were founded by monks returning from China, and temple architecture was one of the main areas of innovation. Pagodas built during that era have endured to the present day, despite earthquakes and typhoons. The second Sui mission, led by Ono no Imoko (小野妹子), was very successful, and on his return he was accompanied by an envoy from China. The third Sui mission, led by Takamuko no Kuromaro (高向玄理) and the monk Soomin (僧旻) had a great influence on the Taika Reform (645) and the development of Buddhism in Japan. Cultural exchanges between China and Japan reached their peak during the Tang Dynasty. The cities of Nara and Kyoto are modeled on the layout of Chang'an of the Tang Dynasty. The art of calligraphy of Wang Xizhi, his son Wang Xianzhi, and Ouyang Xun was also introduced to Japan. Japan continuously sent its envoys to China, as well as exchange students, monks, painters and various technicians, to enhance cultural and academic exchanges between the two countries. A special museum, the Shoosoo-In (正倉院) was built in Nara, in the compound of Toodai-Ji temple (東大寺), to hold items brought from China. It comprises more than nine thousand objects and is proof of the cross-cultural activities during the Tang period. Nakamaro left for China in 718, together with Kibi no Makibi (吉備真備). He never made it back to Japan, and left many tanka poems about being homesick. He won the confidence of the Chinese Emperor Xuan Zong and was send to Annam as a governor. Jian Zhen, a well-known Chinese monk was invited to Japan to give lectures in 742. After five failed attempts to travel east to Japan, he finally reached Japan on the sixth attempt in 753, when he was 65 years old. In the East Temple in Japan, he built an altar where he preached for the emperor, empress, and prince of Japan and more than five hundred monks. Later, he established Buddhist rites in the Jietan Court of the East Temple and the Tangzhaoti Temple. Jian Zhen also brought knowledge of Chinese architecture, sculpture, painting, calligraphy and medicine into Japan. In 2004, the stone epitaph of Jing Zhencheng (a posthumous Chinese name), a Japanese envoy who died at the age of 36 in China, was discovered. This discovery, announced by the Northwest University in Xian, China, is probably the oldest proof of these Japanese missions to China. The early use of the name “Japan” on this epitaph is also remarkable. All links retrieved February 3, 2016. This page was last modified on 3 February 2016, at 17:29.